But after this self-doubt waned, I committed myself to a journey in search of answers to an important question. And in my pursuits of answers to this question, my “what ifs” of uncertainty became “what ifs” of possibility. As a former ELA teacher in a 21st Century classroom equipped with various technologies, I learned to play many roles. Yes, I still provided direct instruction (think sage-on the-stage), but I also became a flexible technician, digital literacy coach, and writing collaborator (more like a guide-on-the-side). I came to know and use a few digital tools that helped me to better meet all my students’ learning needs. Once I recognized that some instructional technologies were making my practices more efficient (i.e., Edmodo and Polleverywhere), as well as more inclusive (i.e., Backchanneling; Krishnan & Poleon, 2013), I was ready to explore other technologies that would help me meet my students’ widely differing needs as writers. Using my Professional Learning Network, both online and off, I started to vet the many resources available for writing instruction. Some free tools appeared engaging and student-centered but seemed to only meet the goal of using technology. Because I was focused on student learning and outcomes, I questioned how much value these tools would add. Would the time it would take to introduce the tool be worthwhile? Would it help my students’ learning in their other classes? Would they ever use the tool again? This was not my reaction when I learned about Noodletools, a program designed by educators for supporting online research and online writing. At this point, I think it’s important to stress that online tools are only a support for evidence-based instructional practices. I must also note that it is crucial to understand each student’s digital literacy skills prior to introducing these tools into classroom practices. Through regular reading and writing tasks designed to develop students’ background knowledge and literacy skills (including digital literacy), I knew my 11th graders were ready to tackle a literature review scaffolded by Noodletools. Because this tool provides tailored scaffolding to each student’s pre-writing needs, I was empowered to encourage each student to choose a topic that aligned with their own interests, an instructional practice that supports student writing motivation (Bruning & Horn, 2010). 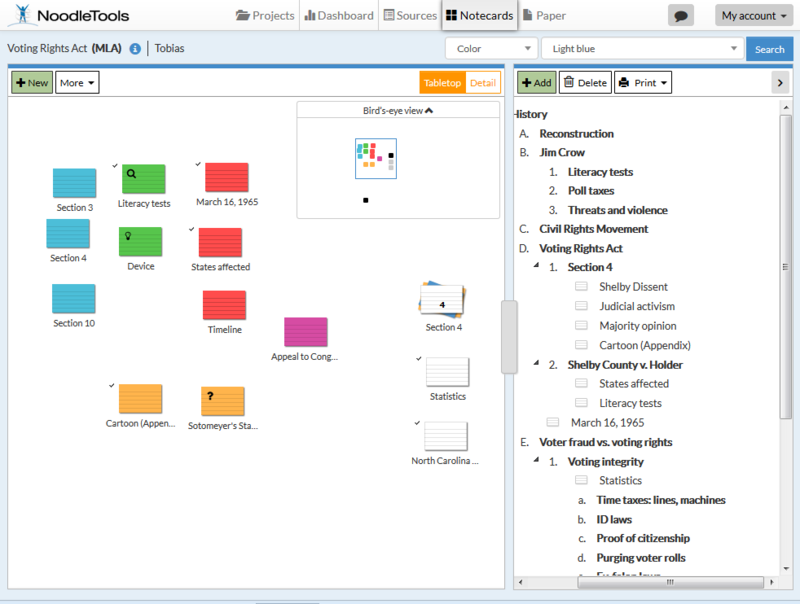 Noodletools’ Dashboard helps students stay organized and focused during searches for scholarly research articles and while engaging in research writing. Users are prompted to set writing goals (i.e., “To-do items”), a practice that aligns with recommendations in IES’ Educator’s Practice Guide for Teaching Secondary Students to Write Effectively—developed by experts in the field of writing pedagogy and writing research. Users can also save their research question(s), so each student is reminded of their specific research purpose each time they log in. The digital notecards page asks students to differentiate between “Direct Quotation,” “Paraphrase,” and “My Ideas.” This is an important feature because some students may plagiarize unintentionally, due to a lack of awareness. I recommend encouraging students to write their in-text citation directly in each digital notecard to avoid this problem. Students can construct their writing outline or they can drag and drop notecards into an outline that they have previously created. Areas in their outline that do not feature notecards can serve as a visual cue to students that they need to continue their search for source-based evidence. This represents both “Goal Setting” and “Planning,” two important elements of the writing process (p. 7). Once students complete the outline and develop notecards that address components of their outline, they will have a solid blueprint from which to start drafting. Although anecdotal, this suggests that Noodletools has the potential to support students’ research writing at the college level and reflects efforts to support college students’ writing development through principles of Universal Design for Learning (Gradel & Edson, 2009). The student success and improved motivation that I witnessed by using Noodletools to scaffold individual student research projects piqued my curiosity about other digital programs that support students’ writing development in individualized ways. This led me down the path to Automated Writing Evaluation (AWE) software. AWE programs evaluate each student’s draft and some programs even provide formative writing feedback in real-time. Although the feedback algorithms are not perfect, there is still utility in these fallible tools. Most clearly, the instant feedback given to each draft is not possible during paper-based writing instruction. Learn more about Revision Assistant, an AWE program, by watching this brief video. In my experience, AWE encouraged students to write and revise- a crucial and often underappreciated component of the writing process. But when they received automated feedback, I encouraged my students to think critically about these suggestions. They were coached to ask themselves, “Does this feedback help me meet my writing goals, or should I choose to do something different?” In turn, they became writing detectives, critically rereading their own words, and each other’s, in new and exciting ways. One surprising consequence of using an AWE program during writing instruction was the unsolicited conversations sparked between writers. Students talked willingly about their writing in ways I had not seen previously. These peer-to-peer learning opportunities, along with the support of AWE, helped my students tackle significant revisions as well as minor edits in grammar and mechanics. Because of these revision efforts, I became less of a copy editor for my students’ writing and forged a path marked by more meaningful writing feedback. I witnessed the development of one particular student’s writing as she took up what Geertz (1988) calls a “writerly identity” (p. 9). The writing support from all her teachers, the individualized learning affordances of the AWE program, and her own commitment to writing improvement all contributed to this student’s writing journey. Julia (a pseudonym) entered 11th grade with 4th grade level writing skills. This likely attributed to her struggle with grade-level writing assignments. One writing task posed a significant problem, yet she would need to write this type of essay as a part of the (former) New York State Regents examination, a prerequisite for high school graduation. Click here to see Julia’s writing development from her initial essay in September to the last one in June when she used ETS’ Criterion, an AWE program, to support her revisions. Despite lingering concerns, Julia’s final piece represents many improvements. Julia’s development of ideas and use of textual evidence are more apparent. She included a thesis statement, discussed her reasoning behind this claim, and demonstrated emerging use of punctuation. Ultimately, Julia’s progress is an example of how automated feedback can support individualized writing instruction, feedback, and student success. In general, my classroom experience with AWE reflected the results of one study (Warschauer & Grimes, 2008). The researchers reported that AWE “encouraged more revision” (p. 22). The researchers also found that AWE saved teachers time. In writing this, my hope is to inspire teachers to explore evidence-based instructional technologies that have the power to support student writing development in individualized ways. Whether it is a tool students can take with them to college or one that helps struggling writers practice the basics, teachers who take this road might make all the difference. Images used with permission from Noodletools, Inc.
Bruning, R., & Horn, C. (2000). Developing motivation to write. Educational Psychologist, 35(1), 25-37. Geertz, C. (1988). Works and lives: The anthropologist as author. Stanford University Press. Gradel, K., & Edson, A. J. (2009). Putting universal design for learning on the higher ed agenda. Journal of Educational Technology Systems, 38(2), 111-121. Graham, S., Bruch, J., Fitzgerald, J., Friedrich, L., Furgeson, J., Greene, K., Kim, J., Lyskawa, J., Olson, C. B., & Smither Wulsin, C. (2016). Teaching secondary students to write effectively (NCEE 2017-4002). Washington, DC: National Center for Education Evaluation and Regional Assistance (NCEE), Institute of Education Sciences, U.S. Department of Education. Retrieved from the NCEE website: http://whatworks.ed.gov. Grimes, D., & Warschauer, M. (2010). Utility in a fallible tool: A multi-site case study of automated writing evaluation. Journal of Technology, Learning, and Assessment, 8(6). http://www.jtla.org. Krishnan, J., & Poleon, E. (2013). Digital Backchanneling: A strategy for maximizing engagement during a performance-based lesson on Shakespeare’s Macbeth. Teaching English with Technology, 13(4), 38-48. Pecorari, D. (2003). Good and original: Plagiarism and patchwriting in academic second-language writing. Journal of Second Language Writing, 12(4), 317-345. Warschauer, M., & Grimes, D. (2008). Automated writing assessment in the classroom. Pedagogies: An International Journal, 3(1), 22-36.